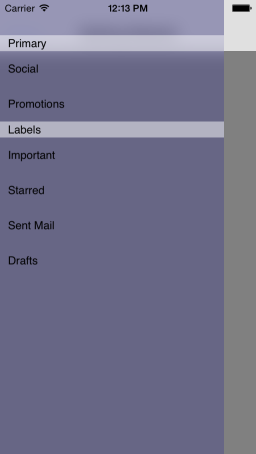 This quick start tutorial demonstrates how to create a simple iOS application with TKSideDrawer. This code creates an instance of TKSideDrawerController and sets it as a root view controller. TKSideDrawerController is a containter controller that has an TKSideDrawer instance embedded inside. The instance is then used by the content controllers of the TKSideDrawerController. The next step is to add UINavigationBar, and items to our SideDrawer. You can get the TKSideDrawer instance from the TKSideDrawerController using the sideDrawer property. Or, instead of using the sideDrawer property, you can call the TKSideDrawer class method findSideDrawerForViewController: (especially useful and necessary for the C# implementation). TKSideDrawer can be attached to your view controllers without TKSideDrawerController. In such a scenario, you should initialize TKSideDrawerView that should be added as subview to your UIViewController's view and use its mainView property to set up the content of the view.